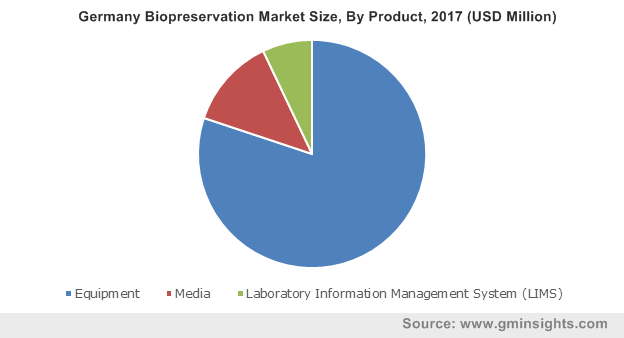 Biopreservation Market size valued at USD 4 billion in 2017 and is expected to witness around 13.4% CAGR from 2018 to 2024. Increasing prevalence of chronic diseases such as cardiac, renal diseases, diabetes and obesity is the major factor that will drive the biopreservation market growth during the forecast period. According to National Diabetes Statistics Report 2017, around 30 million people accounting for 9.4% of the U.S. population had diabetes in 2015. Shortage of organ donors for transplantation will increase the demand for regenerative medicine that should escalate biopreservation industry growth in forthcoming years. Growing R&D investment in drug discovery will positively impact business growth. Surge in the number of bio-banks to store biological products used in different types of medical research will accelerate the industry growth. Government initiatives to support stem cell therapies in disease treatment will further drive the market growth. However, stringent regulations for manufacturing biopreservation products and emergence of room temperature storage techniques may hamper business growth over the forthcoming years. Equipment segment held the largest revenue share of 79.8% in 2017 and is projected to show robust growth over the forthcoming years. Increasing R&D investment coupled with various government initiatives to support gene and cell therapies in treatment of various chronic diseases will increase the demand for biopreservation equipment. 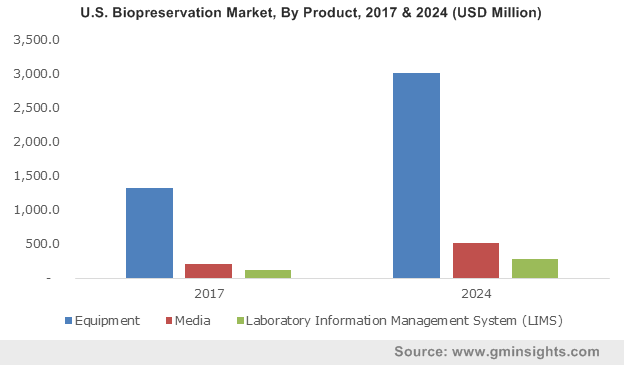 Need for biological freezers and refrigerators for proper storage and preservation of biological specimens will drive the biopreservation equipment business revenue size. Laboratory information management system (LIMS) segment is anticipated to witness highest CAGR of 16.4% during the forecast period. Preference for such systems used to automate laboratory operations has increased in recent years due to technological advancements in biopreservation field. Adoption of LIMS in various lab processes such as sample management, consumables management, plate and gel handling, batch management, inventory management and stability management should positively influence segment growth in coming years. Biobanking segment in biopreservation market was valued at USD 2.9 billion in 2017 and is estimated to witness similar trend during the analysis timeframe. Biobanks are biorepositories that store and preserve biological samples that are used in different medical research. Increasing demand for biospecimens to support various types of contemporary research such personalized medicine and genomics will increase adoption of biobanking thereby fostering the industry growth. Regenerative medicine segment will witness lucrative CAGR of 14.2% over the forecast period owing to its increasing adoption in treatment of severe and life-threatening illnesses. Growing prevalence of chronic diseases leads to organ deformities thereby surging demand for organ transplantation. Regenerative medicine includes engineering or regenerating human cells, tissues or organs to restore or establish normal functioning. Shortage of organ donors will drive the regenerative medicine market growth. Tumor cells segment held USD 720.9 million revenue in 2017 and will exhibit lucrative growth over the analysis period. High growth can be accounted to increasing preference for tumor cells in treating various types of cancers including colon, breast and prostate cancer. Furthermore, use of tumor cells to identify rare cells in body fluid will increase its demand for validation of chemotherapy as well as early diagnosis of cancer recurrence thereby fostering the segmental growth. Mesenchymal stem cells (MSCs) segment accounted for significant revenue share in 2017 and is estimated to witness 13.7% CAGR during the forecast timeframe. The segmental growth can be attributed to increasing adoption of mesenchymal stem/stromal cells in various research studies and clinical trials. Ability of the multipotent mesenchymal stem cells to differentiate into various cell types such as cartilage cells (chondrocytes), bone cells (osteoblasts), muscle cells (myocytes) and adipocytes will increase its adoption resulting in segmental growth. U.S. biopreservation market accounted for 88.3% of regional revenue share in 2017 and is expected to have considerable growth during the forecast year. Increasing prevalence of lifestyle diseases such as diabetes, obesity and renal diseases leading to organ damage will surge demand for organ transplantation. According to the U.S. Department of Health & Human Services, more than 114,000 people were on the national transplant waiting list as of August 2017. Such factors increase adoption of regenerative medicine in disease treatment thereby should spur U.S. market size. UK market was valued at USD 165.3 billion in 2017 and is projected to show considerable growth during the forecast timeline. High growth can be attributed to increasing government support in networking of bio-banks such as UK Biobank and international collaborations for expanding the scope of bio-banking. Such initiatives to improve the prevention, diagnosis and treatment of a wide range of chronic diseases such as cardiac diseases, cancer, diabetes, arthritis, ophthalmic disorders and neurological diseases will surge business growth in the coming years. Some of the key industry players operational in the biopreservation industry include Atlanta Biologics, BioCision, BioLife Solutions, Biomatrica, Chart MVE Biomedical, Custom Biogenic Systems, LabVantage Solutions, Panasonic Biomedical, Qiagen, Taylor-Wharton Cryogenics, Thermo Fisher Scientific and VWR International. These industry players implement certain strategic initiatives such as new product launch, acquisition, and merger that help them in strengthening their market position. For instance, in May 2015, BioCision and Brooks Automation launched CryoPod, a liquid nitrogen based system for reliable, protected and safe handling and transport of cryogenic biospecimens. Availability of such advanced products will enhance company’s existing product portfolio and render company with sustainable profits. The concept of biopreservation can be traced back to the use of cryoprecipitate plasma (CPP) that had the ability to preserve dog kidney for 72 hours with a 100% survival rate after a kidney transplant. Later in 1960’s, Dr. Collin developed the concept of simple cold storage organ preservation and Collins preservation solutions. 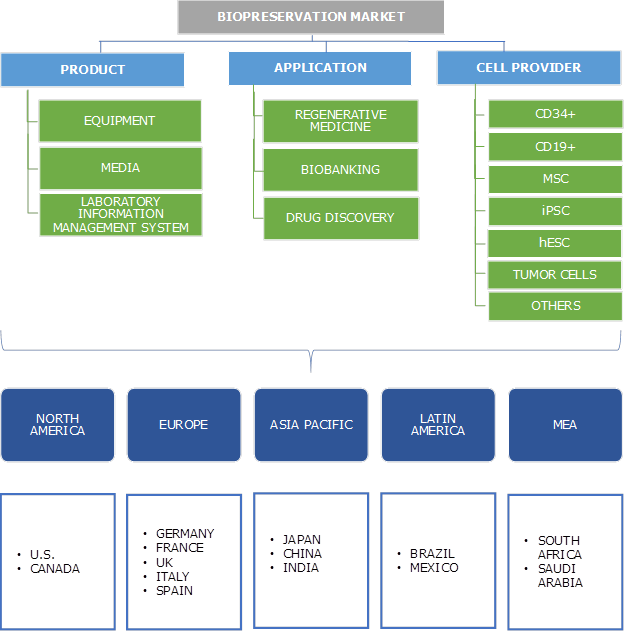 In recent years, key industry players have focused their efforts to develop technologically advanced biopreservation product and techniques that support efficient storage and preservation of biological specimens used in different types of research. Availability of superior quality, advanced, portable, reliable and easy to handle biopreservation equipment will surge biopreservation industry growth over the forthcoming years.